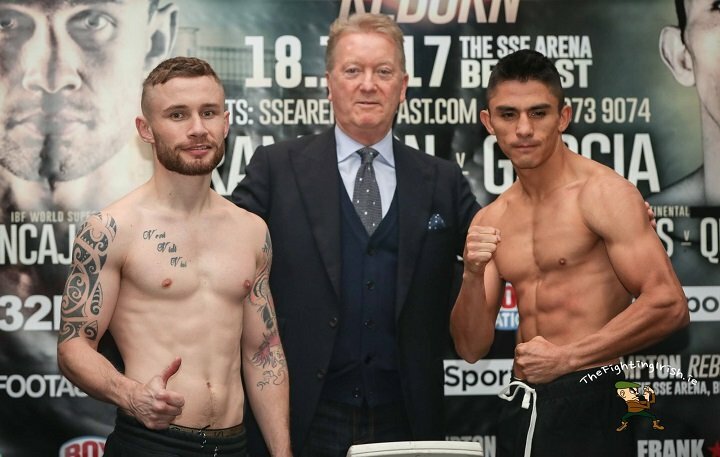 Carl Frampton and Horacio Garcia have weighed in ahead of their headline clash at the SSE Odyssey Arena on Saturday night, while Jamie Conlan and Jerwin Ancajas are all set for their IBF world super-flyweight title showdown. All four fighters took to the scales at Belfast’s Clayton Hotel on Friday afternoon ahead of the weekend’s massive ‘Frampton Reborn’ fight card, which will be screened live on BT Sport and BoxNation. Frampton tipped the scales at 127lbs – the same as Mexican Garcia – with both fighters benefiting from a previously-agreed two-pound excess weight allowance ahead of the 10-round non-title featherweight bout. ‘The Jackal’ came in one pound over the 126lb featherweight limit for his ill-fated clash against Andres Gutierrez last July, which was later cancelled after the Mexican suffered a pre-fight accident. But former WBA champion Frampton is confident that a win on Saturday night will tee up another world-title shot at 126lbs next year. “It’s just been stress-free in the build-up,” said ‘The Jackal’. “I’ve been taking it easy in training and I felt comfortable throughout the week. I could’ve easily made the championship weight, but with it being a non-title fight, both camps were happy to allow the extra couple of pounds if needed. “I know from my training and working with Jamie [Moore, trainer] that I can easily make featherweight and I just need to get the win now before I get a title shot against one of the big names in 2018. Garcia has never been stopped in his 37-fight career, but trainer Jamie Moore insists that Frampton will be the first to halt the Mexican as he expects ‘The Jackal’ to be back to his best on his ring return. “He’s in great shape, great form. He’s done everything he needs to do… he’s on the home straight and ready to put in a good shift,” said Moore. “If Carl puts that shift in, I think he will stop Garcia. I know Garcia has never been stopped before – he’s a tough nut to crack, but with the form Carl’s in and the level of fighter he is, on his best night he’s a couple of levels above Garcia. Meanwhile, Conlan weighed in at 115lbs for his first world-title challenge against Filipino champion Ancajas, who came in at the same weight. The 19-0 undefeated Belfast native has been cool, calm and collected throughout fight week and Conlan insists he will maintain the same approach heading into a potentially career-defining bout. Conlan’s trainer Danny Vaughan echoed those sentiments as he takes confidence from his fighter’s relaxed demeanor. Three-time Olympian Paddy Barnes also successfully weighed in for his vacant WBO intercontinental flyweight title fight – but only after stripping off on the scales! Barnes’ opponent, Nicaraguan Eliecer Quezada, failed to make 112lb weight limit after two attempts, however, meaning the stepping-stone WBO belt will only be on the line for the home fighter when the pair clash on Saturday night. A total of 11 MTK Global-managed fighters feature on the ‘Frampton Reborn’ fight card in Belfast, which marks Frampton’s first hometown bout in two-and-half years. Carl Frampton is hoping to end 2017 on a high as he eyes a trilogy fight with rival Leo Santa Cruz. The Belfast boxer has endured a tough year having lost his WBA world title in his January rematch with the three-weight world champion, before splitting with his long-time training and promotional team. Now the 30-year-old takes on the tough Horacio Garcia in his comeback fight this Saturday, live on BoxNation, and is refusing to overlook the fierce Mexican despite having hopes of sharing the ring with his countryman Santa Cruz once again. “The Leo Santa Cruz fight is the one fight that I want but at the moment the only guy I am thinking about is Horacio Garcia,” said Frampton. “He’s a very good fighter. He’s a stereotypical Mexican fighter – he comes forward, is aggressive, punches hard and takes a good shot. He’s got a good team – he’s with Canelo Alvarez’s people. I think they’re expecting him to put in a good performance. “He’s the only man on my mind at the minute but there are some big fights out there which excite me. Santa Cruz is number one but there is Josh Warrington and Lee Selby also – but we can look at all that after Saturday night,” he said. ‘The Jackal’ insists he is back to his best and will be looking to impress in front of his passionate Belfast fans, on a card that will also see another local Jamie Conlan take on Filipino Jerwin Ancajas for the IBF super-flyweight world title. “I’m really pleased to be back home again. It’s a brilliant card to be fighting on, let alone headlining. I feel good and am looking forward to putting in a great performance,” said Frampton. “There is a spring in my step. I’m in a good place right now and the best is yet to come. I know I can beat any featherweight in the world on my day and that I can become a world champion again. “It’s going to be a cauldron-like atmosphere in The SSE Arena on Saturday. It can hold 9,000 but it sounds more like 30,000. It is the best atmosphere in world boxing. I have won all my fights there by knockout and I hope to do the same again this time around,” he said. 27-year-old Garcia has shared the ring with some tough opponents already including Joseph Diaz and Fernando Vargas. He now steps in against a heavy favourite in Frampton but will have the support of pound-for-pound ace Canelo Alvarez who will be ringside to cheer on his stablemate. “Having Canelo supporting me is great motivation for me. We started out together and have seen each other climb up. It’s very important to me that he is coming out to watch my fight because that will help me,” said Garcia. “I’m going to leave everything in the ring and it will be a great fight. Carl is a great fighter. He’s been in the sport for a long time. To beat him will put me on top of the rankings and people will remember me as one of the guys who beat Carl Frampton,” he said. South African star Zolani Tete will also feature on the night as he defends his WBO bantamweight world title against Siboniso Gonya, with flyweight ace Paddy Barnes fighting on home soil against experienced Nicaraguan Eliecer Quezada. BoxNation’s live coverage will start from 7.25pm this Saturday night. BoxNation is available on Sky/Freeview/Virgin/ TalkTalk/EE/Apple TV/ online at watch.boxnation.com and via apps (iOS, Android, Amazon) for just £12 a month. Buy now at boxnation.com.